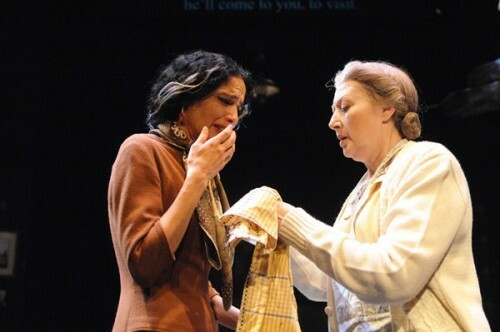 Raida Adon and Rozina Kambos in The Cameri Theatre of Tel Aviv's "Return to Haifa" at Theater J. Photo credit: Stan Barouh. Two women are arguing about their son. One gave birth to him, the other raised him. The adoptive mother makes a cutting comment about the son being more likely to listen to her than his birth mother. Many in the audience laugh. It’s a grim laugh, low and knowing. It was a strange preview night at Theater J, watching the production of Return to Haifa performed by the Cameri Theatre of Tel Aviv in Hebrew and Arabic. Uncomfortable for some, painful for others, odd for me in my role as critic – as the talkback session afterwards becomes a bit of theater unto itself, worth investigating just as much as reviewing the play. I didn’t know what to make of the whole thing when I left. I still don’t. Two mothers. One Jewish, one Muslim. One Israeli, one Palestinian. And their son, all of the above, or none of any of it. Questions arose at the talkback with Anton Goodman, Jewish Agency Shaliach, and Ari Roth, artistic director of Theater J, that still whirl in my head: Is it a play appropriating a beloved piece of Palestinian literature, as one member of the talkback accused? Is it a play attempting to own a dual narrative, to both celebrate and mourn at the same time, as Goodman believed? A play that makes soldiers unable to be strong for their country, as a mother in the audience feared? What I can tell you about Return to Haifa… is that you will leave with many questions. Suheil Haddad, Raida Adon, Rozina Kambos, Nesim Zohar, Erez Kahana in "Return to Haifa." Photo credit: Stan Barouh. Return to Haifa is an adaptation by Israeli playwright Boaz Gaon of a novella by Palestinian author Ghassan Kanafani. The current production playing at Theater J through the end of this month is directed by Sinai Peter and performed by members of the Cameri Theatre of Tel Aviv (there are sur-titles to help you with the Hebrew and Arabic spoken on stage). The action of the play is quite simple and yet I realized while writing that it can’t even be described without the danger of loaded words offensive to either side. The tension over possession and loss – land, home, child – strikes at the heart of the conflict and weaves painfully through the lives of two couples – Sa’id and Saffiyeh, a Palestinian couple, and their Israeli counterparts, Miriam and Ephraim. Sa’id and Saffiyeh are returning to Haifa, to see the house and the son they lost. We see how Miriam and Ephraim gained both (though the price paid, emotional and physical, is high, and the hold is tenuous.). Cutting between the past and the present, the play urges you to have sympathy for all sides. Except, of course, for the governments and bureaucrats. The acting is strong, especially considering the performers are being simultaneously translated with sur-titles which means the audience is sometimes a step ahead of their spoken words. Raida Adon is exceptionally moving as the Palestinian mother whose initial reluctance to face the past shatters in the most riveting part of the production, when she describes what happened the day she left Haifa, pulled away from her home and the baby she had just put down to sleep by the panicking crowd corralled to the docks by the British in 1948. Rozina Kambos as Miriam is all resigned pragmatism, the aching loss of her son during the Holocaust always beating underneath the potential loss of her adopted son. As that son (Dov by adoption and Khaldun by birth) Erez Kahana does an excellent job of showing the softness inside every soldier, that part they try to hide but what truly makes them a man. As previously mentioned, there seemed to be a lot of laughter at the preview, sometimes quite inappropriate. Both director and playwright were at the talkback after the preview I attended this past weekend, and their reactions were very interesting. Premiered in 2008 in Tel Aviv, the play was hailed as “truly magnificent” (Haaretz), but frankly I found it at times distractingly cliched. I suspect that was one reason for the very literate audience’s laughter at times. At the talkback, the director himself seemed to agree, stating the use of irony was necessary and that humor was used to acknowledge the cliches. The playwright was visibly shaken, having never before witnessed those reactions. The audience seemed split between the two. Considering a production meeting took place after the talkback, it’s very possible that what I saw at the preview will have changed for future audiences. However, with a play whose subject matter touches on such an incendiary topic for our times, its artistic value or success is really not the point. If you see Return to Haifa, it’s the play’s message, and the questions that arise, that will reverberate. No one comes to the subject matter without their own preconceptions, regardless of your depth of knowledge about the Israeli-Palestinian conflict. They will either be cynically confirmed or radically changed. Gaon stated he wrote the play so that his mother, a Holocaust survivor, would cry for the Palestinian mother, to open people’s hearts. Does it work? “You killed him,” a woman in front of me said, referring to Kanafani’s alleged assassination by the Mossad in 1972. “I would not want my children to see this,” an Israeli mother said, “until after they had served their time in the army.” Both moments chilled me more than anything I saw on stage. I still don’t know what to think. As neither Jew nor Arab, these aren’t my narratives to try and untangle, not my wounds to try to heal. It would be presumptuous of me to cast judgement so quickly, on something created to start dialogue. So I encourage you to see it for yourself, regardless of your background, and be prepared to leave with more questions. For I do know, an easy response is the wrong response. 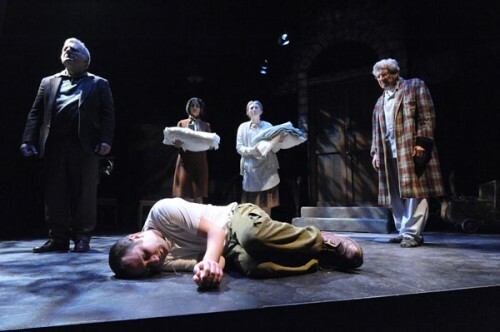 Theater J presents the Cameri Theatre of Tel Aviv’s production of Return to Haifa. Located at 1529 16th Street, Washington, DC 20036. Closest Metro Stop: Dupont Circle (Red line). For more information call 202-777-3230. Thanks for the review- I noticed the link to Theatre J is broken. Thanks for letting me know, A. It should be working now.